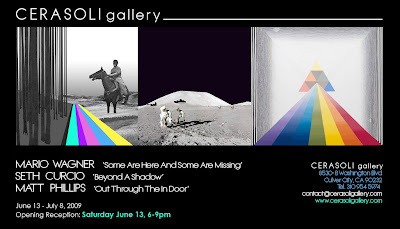 C E R A S O L I Gallery presents a selection of works by three artists working with collage as their medium, MATT PHILLIPS 'Out Through The In Door' in Gallery One, MARIO WAGNER 'Some Are Here And Some Are Missing' in Gallery Two, and SETH CURCIO 'Beyond A Shadow' in Gallery Three at Cerasoli. Opens June 13, 2009, and remains on view through July 8, 2009. Greg Gossel - upcoming solo show "Happy Endings" will be opening this Saturday, June 13th from 7-11PM at the Shooting Gallery in San Francisco.